NORTH TEXAS (CBSDFW.COM) – Texans lose tens of thousands of dollars a year at the hands of fraudulent roofers, but state lawmakers could soon add some long-awaited consumer protections. Dietitians, barbers and manicurists are all jobs with more oversight than roofers. Jodi Johnson of Watauga said she had nowhere to turn when a rogue roofer stole her money last fall. 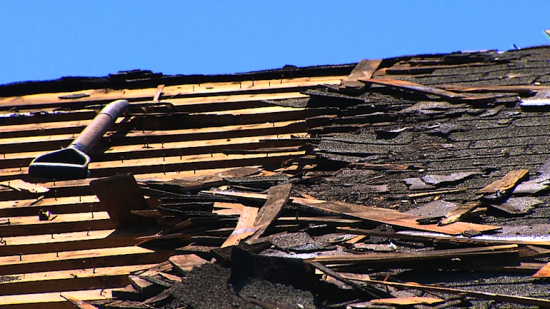 She nearly lost $6,000 after a crew removed every single shingle from her roof, then vanished. “There are holes in the roof, we need a new roof, what are we going to do?” Johnson remembered thinking days before Thanksgiving. There was only one thing to do: Finish the job herself. Johnson watched YouTube videos, then installed new shingles on her own roof. Johnson had never fixed a roof in her life. Yet, in the eyes of Texas, she was just as qualified as the man who ripped her off. “Every state in the U.S. should have protection from these people,” Johnson said. Few, if any, Texas state laws punish fraudulent roofers, who often roll into town after a natural disaster. The scenario has left thousands of homeowners with shoddy work or no work at all. When it comes to roofing, Texas is the only Gulf state without protections for consumers. But this year, during this legislative session in Austin, all that could change. “We’re allowing people to get ripped off and we don’t have a remedy for them,” said attorney Steven Badger. Badger has represented dozens of individual homeowners ripped off by shady roofing contractors. He is currently pursuing a class action on behalf of more than 100 North Texas homeowners who had their insurance checks totaling over $500,000 stolen by a single contractor. Badger is backing a bill that would hold contractors accountable. He said perspective gained after Hurricane Harvey could be the impetus for change. “There’s more awareness that has gotten people thinking that perhaps it’s time we finally need some regulation,” Badger said. Even the roofing industry is asking for more regulations. “We’re very cognizant of the fact there are bad actors in our industry,” said Dan Pitts, the former president of the Roofing Contractors Association of Texas. RCAT is asking for a bill that requires two pieces of information from roofing contractors: Proof of name and address. From that, the state would create a database where consumers could research contractors in a transparent manner. “The contractors would want to be on the list so they’re recognized by consumers,” Pitts said. But while stakeholders and consumers appear to support changes, it’s unclear if Texas legislators do. The Ones for Justice contacted every incumbent lawmaker ahead of the 2019 legislative session. Nine percent of those legislators said they support a bill with more regulations, including Rep. Giovanni Capriglione, who authored a bill last session and plans to do so again. While only three lawmakers explicitly said they will not support a bill, 60 percent of the legislators CBS 11 contacted never responded. If that’s surprising, consider this. For the past 10 years, every sizable effort aimed at regulating the roofing industry has died. “Two chucks in a truck can show up after any hail or windstorm, call themselves a roofer, take people’s insurance checks and disappear,” Badger said. Johnson knows her money and the roofer are gone. But before the next storm, she said she hopes people like her are protected. “Who did I have to turn to? No one,” Johnson said. Rep. Capriglione says he plans on filing the bill soon.